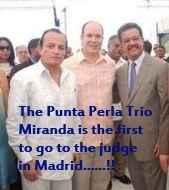 This entry was posted in Uncategorized and tagged fraud case, leonel fernandez, madrid, prince albert of monaco, punta perla news, ricardo miranda by admin. Bookmark the permalink. Dear John, Pls contact “Antonio Flores” , he is the lawyer behind the Class A lawsuit against Miranda. You should get hold of LAWBIRDS in Spain lfgonzalez@lawbird.com. They are the ones handling the lawsuit for the investor group headed by Ollie Reel ollie_reel@yahoo.com. Its moving forward and even the ex secretary Virginia Mateus has been called by the judge. She is an important witness as she holds deep knowledge about where Ricardo Miranda transferred all the cash belonging to the investors!! I am an investor from the US and I would like to connect with other US investors who have invested in Punta Perla. I want to pursue legal action against Ricardo Miranda.